CLEAN ENERGY TRIP: Richmond Valley deputy mayor Steve Morrissey, mayor Robert Mustow, Japan's State Minister for the Environment Tsukasa Akimoto and general manager Vaughan Macdonald in Japan. A RECENT study trip to Japan by Richmond Valley staff was not a waste. But waste is a problem in Japan and here in Australia. "Without the luxury of land for landfills, the Japanese people appear to have a real commitment to accepting responsibility for their own waste and recycling everything possible,” mayor Robert Mustow said. With deputy mayor Steve Morrissey and general manager Vaughan Macdonald, Cr Mustow toured three cutting-edge energy-from-waste facilities in Tokyo, Nagano, and in Gotemba at the base of Mt Fuji. The facilities supply reliable, base load renewable energy to power communities and divert waste from landfill, while preventing greenhouse gas emissions from decomposing garbage. Richmond Valley Council is looking at alternate waste management options to meet the challenge of steeply rising costs to manage waste and is working with Japanese company Pacific Consultants who are finalising a pre-feasibility study for an energy-from-waste facility on the Northern Rivers, Mr Macdonald said. "Japan is considered a world-leader in energy-from-waste technology,” he said. The Nagano Environmental Energy Centre processes 405 tonnes of landfill per day and generates 7900 kW of electricity, enough to provide power to the new aquatic centre next door which features a 25m swimming pool, wave pool, therapy pool, slide and other amenities. 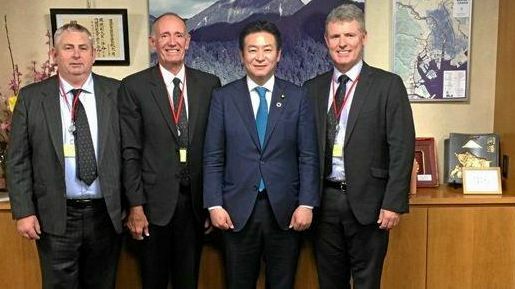 The Richmond Valley delegation met with State Minister for the Environment Tsukasa Akimoto in Tokyo to discuss the Japanese Government's support for introducing the technology into Australia. While in Japan, they also met with the NSW Government's Trade Commissioner to Japan, Peter Knight. Cr Mustow noticed how few public bins there were in Japan. "Yet it is a very clean country,” he said. Council wants to address the current challenges in waste management and recycling which has seen the costs of both landfill and recycling waste more than double in less than twelve months. "The Namoona landfill at Casino is near capacity and a new landfill cell is estimated to cost close to $10 million dollars just to have it ready to accept waste,” Mr Macdonald said. The Council's trip was funded by a grant from the Japanese Government.